﻿ E-ink-Reader. The review of electronic books ONYX. 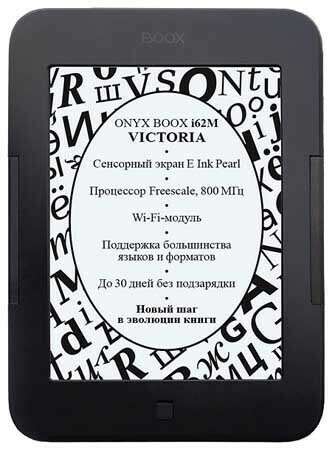 The international company ONYX International specialises on release of electronic books and delivers them in variety of the European countries, including Russia. It has let out already some models of electronic books from which for today in shops models i62 and i63 series. i62m Victoria, i62m Albatros, i62m Dream differ from each other only in colour of the case and the price. The case of model Victoria is black, Albatros - white, Dream - grey. The screen of devices - E-ink Pearl touch, a diagonal of 6 inches, the permission is standard - 600 on 800 points. At model Dream the screen touch E-ink Pearl HD with the permission 758 on 1024 points. All models have module Wi-fi, the Internet browser, support almost all formats of files. Browsing keys on electronic books are located on both sides that allows to hold equally conveniently them by any hand. Loading of additional applications, games and fonts TTF are realised. There is a quite good file manager for management of files. Very interesting developers have approached to realisation of reading of documents. In the menu of "ADJUSTMENT" for reading of formats FB2 and EPUB it is possible to choose one of two programs for reading the most popular in Russia - FBReader, established on all readers Pocketbook, or CoolReader, established on LBOOK reader. In the last case footnotes in the text should be displayed in the bottom of page. Complete set Onyx BOOX i62M also the worthy: the Book, an USB-cable, the charger, a strong bookcover. 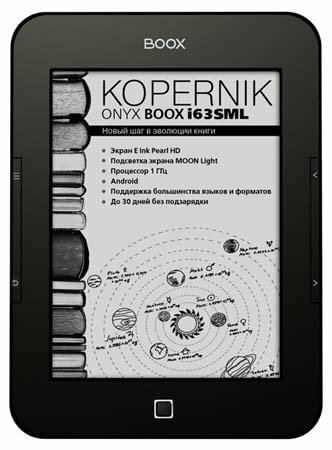 i63SL Kepler, i63ML Kopernik, i63ML Maxwell the next series of models of e-books from ONYX BOOX. Device design has not changed. Two the most important differences from the series i63 i62 – using of Android operating system and adjustable LED backlight. Screen devices - E-ink Pearl HD, 6-inch diagonal, high resolution - 758 x 1024 pixels. A model i63SL Kepler screen is not touch, no module wi-fi, but there is an audio jack for ear phones, internal memory - 4 Gb. Модель i63ML Kopernik is different from Kepler merely the absence of a jack for ear phones. Модель i63ML Maxwell Maxwell model has a touch screen, wi-fi module and internal memory of 8 Gb. There is no jack for ear phones. All models allow you to use additional applications for android format. Apk. Bookshelf readers is improved for a little. Now it shows the book covers, but still does not show the titles and authors' names. Function keys are located on the sides of the device, they can be swapped, but unfortunately can’t be configured to simultaneously flipping pages and the left and right arrow keys. Grade Onyx BOOX i63 remains the same: The Book, USB-cable, charger, durable bookcover. Advantages of a design and equipment: Touchscreen display of last version, the thin beautiful case, convenient arrangement of keys, the power unit and cover in the equipment. Design and equipment flaws: Has not been detected. Advantages of the software: Support of folders on a flash card, fonts with a mode antialiasing, support of all formats of the text, one of two programs of reading on a choice, Wi-Fi, downloading TTF-fonts. Software flaws: The bookshelf does not show neither names of authors, nor names of books, covers - only a file name. Foreign applications and updates: Games for Onyx BOOX i62M. Selection of resources of the Internet aboutOnyx BOOX is in section "Links."